Dairy Queen looks to cater to single people, in addition to couples, this February with the new Singles Blizzard. The new Blizzard features salted caramel truffles, Reese's Peanut Butter Cups, and peanut butter topping blended with vanilla soft serve. Apparently, according to the company, single Americans now outnumber married Americans so they're just catering to that. You can still get the returning Red Velvet Cupid Cake though. The Red Velvet Blizzard Cupid Cake consists of vanilla soft serve blended with red velvet cake pieces and cream cheese frosting. Prices for the cake start at $9.99. 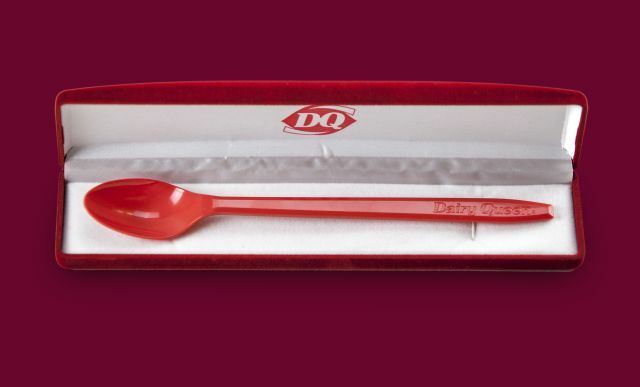 For people who like their Dairy Queen just a little more than others, the brand is also once again offering the DQ Red Velvet Spoon Case. For $4.99, plus shipping, the spoon comes resting on a satiny white pillow in a red velvet-covered traditional jewelry box. The net proceeds (about $3 each) from online sales of the spoon case will benefit Children's Miracle Network Hospitals.